Whew, we are so close to the end of the first month of the year. January has a tendency to feel like a long month and this year it certainly lived up to that expectation. I am ready for a new month, as much of January was filled with my feeling overwhelmed and unorganized. While a lack of organization wasn’t the case, the struggle of developing normalcy in a new routine was taxing. Although there has been stress, I have found some new favorite products to use this month that I am pretty excited to share with y’all. Last year I started off the year strong sharing my monthly favorites and those posts are so fun to look back on. This year I hope to continue to share these product recommendations with you as well. Whether they are items you’re looking for or not it is my hope that in return you’ll share some of your favorites with me too! I had been wanting a smaller crossbody for the majority of last semester and when I saw this one I knew it was the one for me. The size is perfect fitting my phone, keys and ID, lip balm, and a few other essentials. 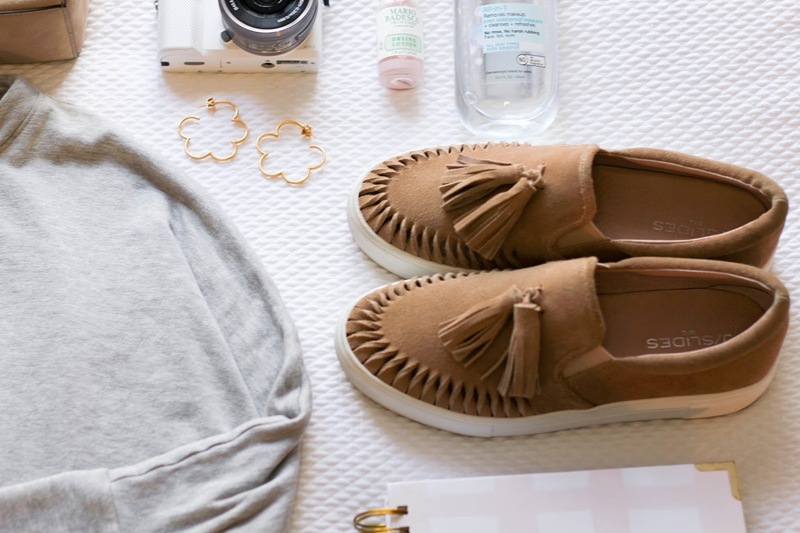 The stone color matches pretty much everything and the tassel on the side is a fun unexpected touch! The best part is that it comes in a ton of different colors so if you’re looking for something with more of a pop you can still grab it in this style. I asked for a couple of pairs of these for Christmas and they have gotten so much use as I’ve made my way to barre this month. I like that I don’t have to worry about the room getting steamy and sliding around on the floor when I have these on. I have a grey and a white pair but want to add a black pair to my collection as well so that I don’t have to do laundry as often. My skin has been acting pretty weird this month and I haven’t come up with many solutions other than this drying treatment. It goes on pink and kind of makes you look like you have a rare case of the chicken pox when it is on but after sleeping with it on overnight it really does do a good job of starting to clear up any blemishes you may have. Random, I know but I forgot just how delicious chocolate covered pretzels are. Trader Joes has a decent sized bag that I went through all too quickly during recruitment and I’ve been wanting to go back to Trader Joes to get more! While I had a number of favorites from my Christmas gifts, this Sony a5000 camera has topped the list. I have already gotten so much use out of it and am slowly discovering more of its features. All of the vlogs I’ve done this month and our bid day video were shot on it, and I love the way those have turned out. While it isn’t meant to replace my DSLR camera I have been so impressed with its photo taking abilities as well. I can’t recommend it enough. Speaking of vlogs, if you’ve been watching them it is likely that you’ve seen a lot of this grey beyond yoga pullover. I have worn it so much since getting it in November and have found that it is perfect to throw on over a workout tank or t-shirt for another layer of warmth. After wearing it a number of time to sorority meetings and getting compliments from friends, a few of them have even gotten it in black which is equally as cute. Slip on shoes seem to be everyone’s favorite lately. While I own a few different pairs, this pair from J.Slides with tassels on the top are my favorite. They provide a unique and fun twist to an otherwise normal outfit item. 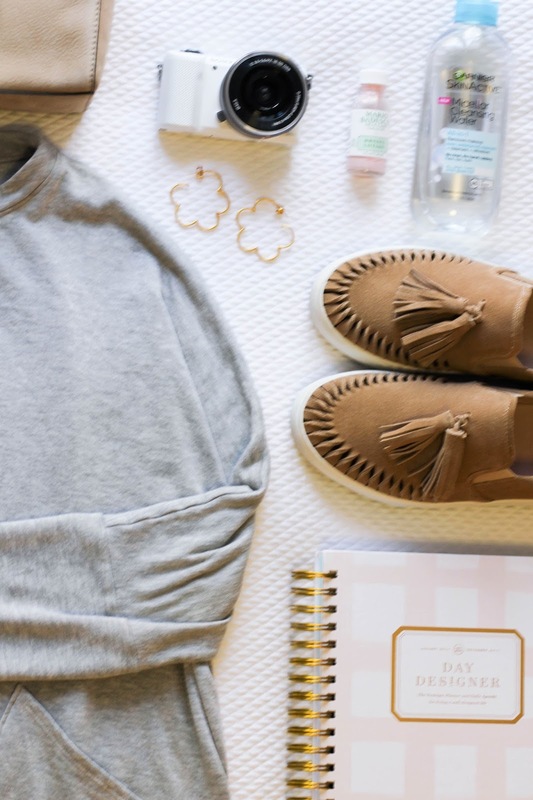 If the tassels aren’t your favorite or you’re looking to spend a little bit less- thispair of $24(!) 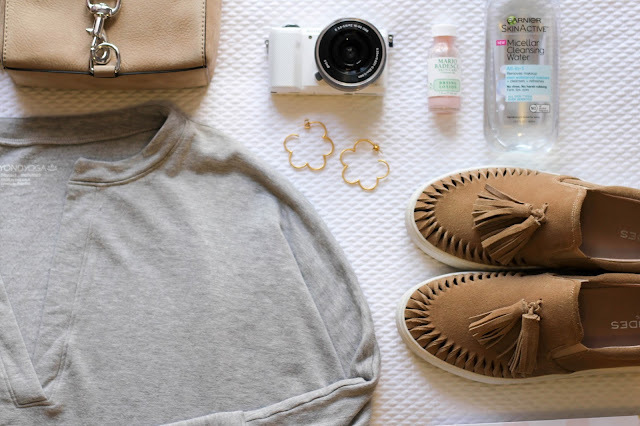 slip-ons are incredibly cute as well. I’ve been a long time fan of Neutrogena’s Makeup Removing Oil but this product does the same sort of thing and comes with more in the bottle for the same price. It also isn’t marketed as just for your eye makeup and comes in a waterproof version too. Before washing my face at night I take one cotton round and soak it in this to remove a day's worth of makeup. Y’all are probably so over hearing me rave about my planner but I just want everyone to be as content with their agenda and its organization as I am with mine. I haven’t had an academic planner in a while so January meant that it was time for a new one, and I love the print I chose for this year. My brother gave me these hoops for Christmas and I’ve loved being able to take a break from my typical pearl studs on occasion. I have the medium sized pair which is perfect for everyday wear, and each time I wear them someone always compliments them. We’ll give my brother credit on this one for having good taste, despite the fact that I picked them out. While there have been a number of other items I’ve been loving this month, these top that list! P.S. I am just as perplexed by why there all of the fonts aren't matching up in this post too, sorry about that! So jealous over your new Sony camera. I want one soooo bad but it's out of my budget at the moment! I love the shoes. I posted a round-up of slip-ons. I should've included your pair in the post. I saw chocolate covered pretzels and went "YAAAAAS!" because they are the most underrated sweet treat ever. Also, I second the first commentor that I'm so jealous of your new camera. Is there a link to your bid day video somewhere? I was Greek in college too so I have a weird love for watching Bid Day videos haha.